Monsieur Hemlock Marreau and his associates are the creation of Rob Farrow, a founder member of Frayed Knot Theatre Company. To date Rob has written eleven Marreau plays. All are currently available for professional or amateur performance. was performed at The Court Theatre, Pendley, Tring. 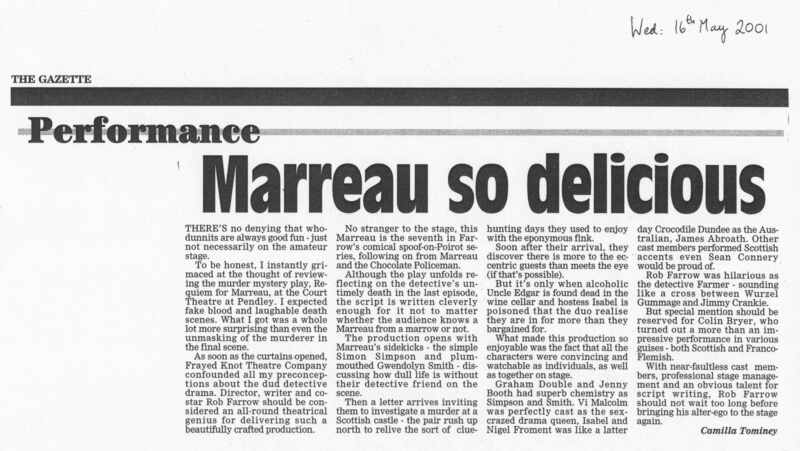 Although the Marreau plays form a sequence with several characters in common, each episode is also written to stand alone as an individual play, where no prior knowledge of the protagonists, nor of earlier events is required. The plays were specially written for production by amateur companies, having fairly large casts with a wide range parts - from just a few lines for inexperienced actors through sparkling cameo rôles to the substantial parts of the investigating trio. Almost without exception each rôle - even the minor ones - has a well defined and interesting character which allows for considerable development by both the actor and director. The second adventure finds the trio attempting to recover some fantastically valuable stolen jewellery in The African Moon - a case which quickly becomes far more serious with a succession of murders. This play features the fearsomely unpleasant Raging Ranulph a cruel bully who has a very murky past. or any other francophone country for that matter - often changing his mind several times during a play. He considers himself the greatest detective who has ever lived; he is, however probably sadly deluded. Marreau is highly reliant on the intelligence and common sense of Gwendolyn - but in the third episode, The Curse of Cardiff, she is far more interested in getting to know one of the suspects, "New Mexico" Smith, than attempting to solve the most mysterious case. Centred around the curse of an ancient Egyptian mummy, this mystery has many unusual developments. Gwendolyn is absent from the fourth adventure, Marreau and the Bloody Carpet, as she has married "Mexi" and settled down to a quiet life with him - she thinks. In this episode we first meet Marreau's arch enemy, Professor Maurice Hearty. This evil genius causes many problems for Marreau not only in this play but also in devious ways his influence is felt in later episodes too. Hearty's malevolent activities also have a drastic effect on Gwendolyn and her husband "New Mexico" Smith - as told in the fifth play The Sword of Carthage, set in their country home. We also meet Havelock the butler again - whom we had originally encountered in the second play - as he is now buttling for the Smiths. By the sixth adventure, The Clouds of Death, Hearty's malign influence has become intolerable and in a dramatic final scene Marreau and Hearty face each other in a life and death struggle in Wildboar Castle - where they have been drawn by the mysterious disappearance of an old Silesian count. Cornwall is the setting for the eighth play The Tregalleon Inheritance, where Gwendolyn has been invited to an old manor house for the reading of a will - that of a relation she did not realise even existed. Strange sounds and even stranger people are waiting to greet her ! The local legend of "Moon-gnashers" causes fear - and the late Sir Crispin had some very unusual hobbies. The ninth instalment, Marreau and the Terror of Tring finds Marreau and his friends trying to discover the truth behind what appears to be Vampire attacks ! The population of the quiet country town of Tring have been terrified by a mysterious creature which has already claimed four lives ... and hasn't finished yet. The tenth outing for Marreau, Marreau and the Grey Dagger finds our hero once again clashing swords (metaphorically) with his bête noir, Professor Maurice Hearty; who is planning to frame and discredit Marreau while everyone is searching for the fabulously valuable "Grey Dagger" of the title.